Another Monday...Another sketch from MJ at TechnoStamper! I can see me using this weeks sketch for quite a few stamps I own. 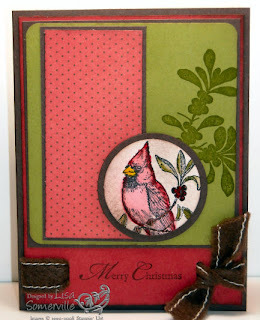 I had a few images in mind when creating this card - but decided to use A Cardinal Christmas from the Holiday Mini catty. I'm quite happy with the way my card turned out. The cardinal image is stamped in black on watercolor paper and colored using the Marker Water Coloring technique from a past issue of the TJNL. I then used my sponge dauber and chocolate chip ink to add color to the edges and any open space on my watercolor paper. The designer paper is from Holiday Treasures. To add some interest behind my cardinal, I stamped the branch from A Cardinal Christmas in old olive. Wanting to fill in the space near my sentiment, I punched a hole with my horizontal slot punch, and threaded and tied on my felt ribbon from the Alpine Ribbon Assortment. If you'd like to purchase any of the items I used you can order via my website or email me to place your order. If you'd like to play along with this weeks challenge, you can leave a link to your project, or if uploading to SCS, please use keyword TSSC41. Beautiful Lisa! I love love love this image! I love the ribbon treatment here. And the background is perfect. Great card, thanks for playing. Very pretty card Lisa, I like the colors and the ribbon threading is AWESOME! Lisa, this is SPLENDIFEROUS! love how you did the ribbon! great job! Love Love Love it! What a strikingly beautiful card. Love the branch idea and the ribbon threading. Great job!